We love weddings, large and small. We had the chance to work with a very lovely couple, Phil and Matt several months ago on their intimate wedding in Boston. Both work in creative industries, so they wanted their wedding attire to be unique, yet classic. 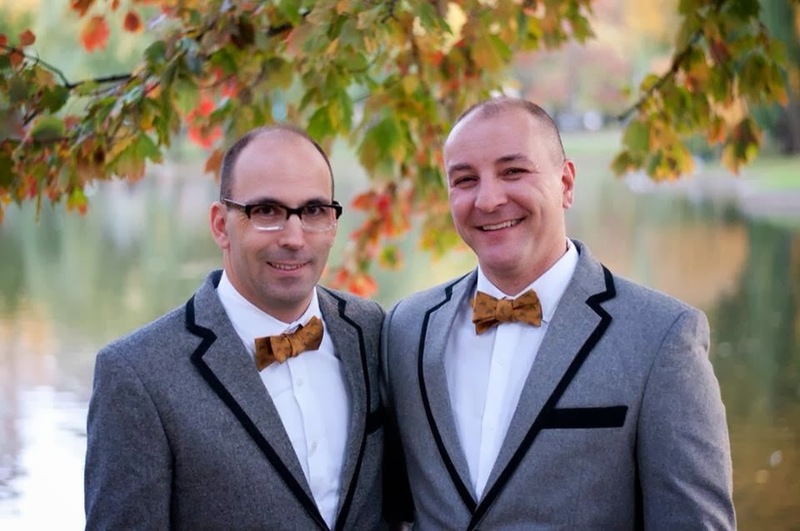 When they decided upon two complementary gray tweed blazers with matching contrasts, we were beyond thrilled! When the blazers arrived in the studio and we had posted it online, it set our Facebook feed a blaze with rave reviews! Why did you choose custom? When selecting wardrobe pieces nothing is more luxe than custom made pieces. You and the tailor drive fit, fashion and fabrication, it is the ultimate luxury experience. What’s your best style advice? Less is more, classic is best, don’t over think it. A trend is one step away from a fashion don’t. What or who inspires your style? You may laugh but… who was better dressed than Ricky Ricardo. He had amazing style, incredibly masculine yet very classic. Congratulations again to Matt and Phil! Need attire for your wedding? E-mail us at info@9tailors.com.